Pear Tree Farm Guest House and DERBYSHIRE ARTS are run by Sue & Alan Barber, a local couple who have lived in the area all their lives. DERBYSHIRE ARTS was set up to offer a tranquil and welcoming environment for artists to learn and relax and give Sue, an artist herself, the chance to paint more. We offer a variety of short-break residential painting holidays in a variety of media. Courses vary from those suitable for beginners through to masterclasses from internationally renowed artists. Please look at our Arts Section for more information about our current courses. 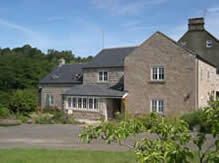 Pear Tree Farm Guest House has been thoughtfully created to offer perfect accommodation for all our visitors. Whether attending an art course or enjoying a break with family or friends we have double, twin or family rooms to suit all needs. Please note we have two ground floor bedrooms with access for disabled guests. These prove popular so please telephone ahead if your require one of these rooms. Please look at our Guest House and B&B Section for more information to discover your personal favourite.